Few days ago, a client sent me an SOS email declaring that she absolutely have to lose weight. I was going to send her couple of tips and also to encourage her to sign up for the Naija Weight Loss Challenge that will help her transform her body in just 30 Days. However, on a second thought, i decided to ask her the major reason why she wanted to lose weight. And she responded…“I don’t know…I am getting fatter by the day and its not pleasant”. And that comes to my topic for today. You see, if you want a flat belly or toned arms or reduce the amount of fat on your hips, you need to be crisply clear about why you want one! One of the actions you can take today is to write down the list of clear cut reasons that you want to lose weight. You need to be specific about it. Don’t just say; if i lose weight i will live a better life, you need to state exactly what things you will be able to do that will lead to that better life. Let me tell you, there are lots of people who want something, but at the end of the day, only few get it. You need to have “these reasons” it stored in Notepad on your phone, or on a cardboard, or on the back page of your writing pad, or even on a sticker note put on your bedroom wall etc. 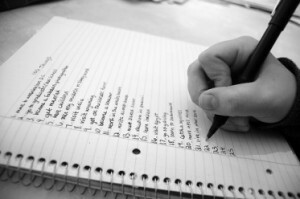 Now, once you have your list, read it at least once a day. Read it every single time you feel conscious about your weight. And make sure you share your list with your accountability partner. Note – If you want to know who an accountability partner is, you should read my post on 3 Steps to get rid of unwanted fat. Anyway, to give you ideas on motivating reasons to lose weight, I have compiled below the top ten reasons why some clients (who sent me email) want to lose weight. Reason # 6 – I’ll be fit and will not get out of breath easily. Reason # 7 – I will not get teased or be the subject of discussion for others. So the above are few reasons why anyone should take deliberate step to lose weight. Now, this list is not exhaustive as we are completely different and have different motivating factors and goals. So, I want you to share your own personal reasons why you want to lose some weight by leaving a comment in the box below. If you are on facebook also, you can leave a comment using the facebook comment box below too. Remember that when you share your reasons, it becomes real to you and you get motivated to lose all those unwanted fat. So go ahead now…leave a comment below. P.S If you have any comments or questions, please leave a comment in the box below and I’ll reply to them. P.S.S – If you enjoyed this article, please ensure you share them with your friends and family.